This step by step diy article is about 2×4 bed plans. If you want to build a nice farmhouse bed out of 2×4 lumber, pay attention to these instructions. 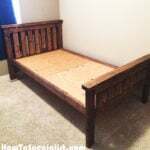 Although there are many designs you could choose from, in this article we will show you all you have to know about making a classic twin size farmhouse bed out of common materials. If you have worked with lumber before, the carpentry techniques should be familiar to you. Buy quality lumber, made for building lumber, if you want to get a durable bed. Nevertheless, you could save some money if you purchase lumber with knots, which could even enhance the look of project, giving it a rustic appearance. Select the slats with great attention, checking if they are in a good condition (the lumber has to be straight and without chips, dents or cracks). Always aligned the components before locking them together with screws. In addition, we recommend you to pre-drill the lumber, otherwise the wood might easily split. Add glue to the joints, if you want to enhance their bond. Smooth the cut edges with fine grit sandpaper and remove the residues using a vacuum cleaner. Make sure you take a look over the related plans to get an idea about what you can build for your home. The first step of the woodworking project is to build the footboard for the simple farmhouse bed. 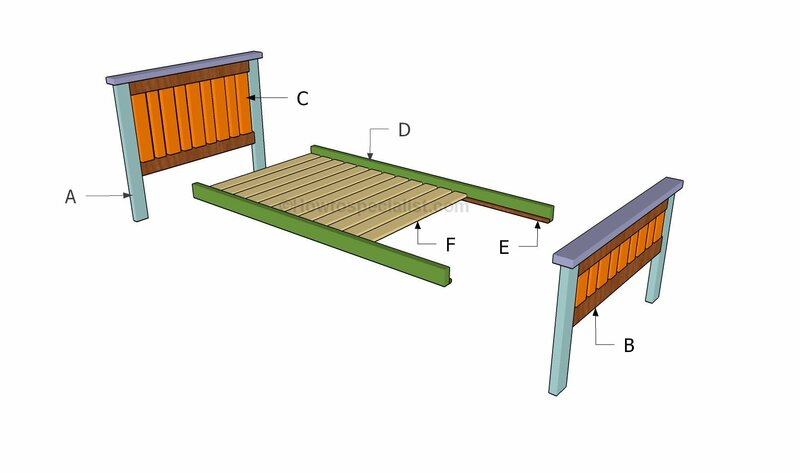 As you can easily notice in the diagram, we recommend you to build the components out of 2×4 lumber, after taking accurate measurements. Drill pocket holes at both ends of the cleats, as well as at both ends of the guard rails. Align everything with attention, making sure the edges are flush and insert 2 1/2″ screws and add glue to make sure the structure is rigid. Next, you have to fit the 2×4 trim on top of the footboard. Drill pocket holes along the top of the top cleat and insert 2 1/2″ screws into the 2×4 trim. Work with attention and add glue to the joints to create a rigid bond between the components. Next, you have to build the headboard in the same manner described above. The only difference is the size of the components. Drill pocket holes at both ends of the cleats and of the guard rails. Assemble everything tightly with 2 1/2″ screws and add glue to the joints. Place the guard rails equally spaced. Fit the 2×4 trim on top of the headboard and secure it to the structure by using 2 1/2″ screws, after making several pilot holes. Add glue to the joints and remove the excess with a damp cloth. After building the footboard and the headboard, you need to lock them together by fitting the side slats to the bed frame. Drill pocket holes at both ends of the slats and secure them to the structure by using 2 1/2″ screws. Add glue to the joints and remove the excess by using a damp cloth. Make sure the slats are perfectly horizontal and the corners square. Leave no gaps between the components. Next, install the 1×1 cleats to both sides of the bed frame. In order to get a professional result, we recommend you to check if they are horizontal by using a spirit level. Drill pilot holes and secure them into place by using 1 1/4″ screws. Add glue to the joints and remove the excess with a damp cloth. One of the last steps of the project is to fit the 1×4 support slats to the cleats. Cut the slats at the right size and secure them into place by using 1 1/4″ screws. Place the slats equally spaced to get a professional result. Use 2×4 lumber for the side rails. Remember that this step is optional and that you should adjust the size of the rails according to the thickness of the mattress and based on your own needs. This is just a starting point, so have this in mind before building the rails. Last but not least, you need to take care of the final touches. Therefore, you need fill all the holes with a good filler and let the compound to dry out properly, before sanding the wooden surface with 120-grit sandpaper. Smart Tip: Clean the residues with a dry cloth, before staining the platform loft bed with the appropriate products for your tastes and needs. Afterwards, install the mattress and take a nap. Thank you for reading our article about 2×4 bed plans and we recommend you to check out the rest of our home improvement projects. Don’t forget to share this projects to your friends, using the social media widgets, if you’ve found it useful. Like us on Facebook to be the first that gets the latest updates and to help us create more free plans for you. The attachement of the side rails to the headboard and floor board is the most critical step in building a sturdy bed. Clearer instructions (and drawings) of how this is accomplished would be helpful. Pocket holes at both ends of the rails and 2 1/2″ pocket screws. Alternatively, you can use 3″ lag bolts through the legs into the side rails (in case you want to disassemble the bed easily). Can this bed to taken apart and moved? We are a military family and move often. So this is essential. Yes, if you use these fasteners for the side rails: http://amzn.to/2kdFU4f In this manner, you can take the bed apart and have the headboard, the footboard and the rails separately. Does this fit a standard toddler mattress? This bed is designed for a 38″x75″ mattress. Do you have plans for a full size version of this bed? How exactly did you attach the 1×1 cleats? You drill pilot holes and use 1 5/8″ screws. If I wanted to use this design with the toddler mattress, could I simply adjust the cleats and slats to 27″ and the trim to 36″? We have about a 37″ wide space to place the bed in. I would go for 28″ so you 1/2″ on both sides to fit the mattress. 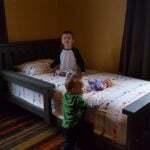 You should also set the side boards to 53″ (a standard toddler mattress is 52″ long). Interested in a plan using 2x lumber for a queen size bed. Can you provide the changes in the plan for queen size frame? I’ll add your suggestion to my to do list.